As many of you read in my last post (or knew already from social media) we're living in a 5th wheel camper trailer while we remodel/rebuild our new house. It seems like the last few years have seen us downsizing several times, and each time was smaller than the last! I feel like every time we had to go smaller, I made some mistakes, learned some tips, and got a little better about getting rid of stuff to live with less. Even though this time is only temporary, it's also the most extreme we've gone. 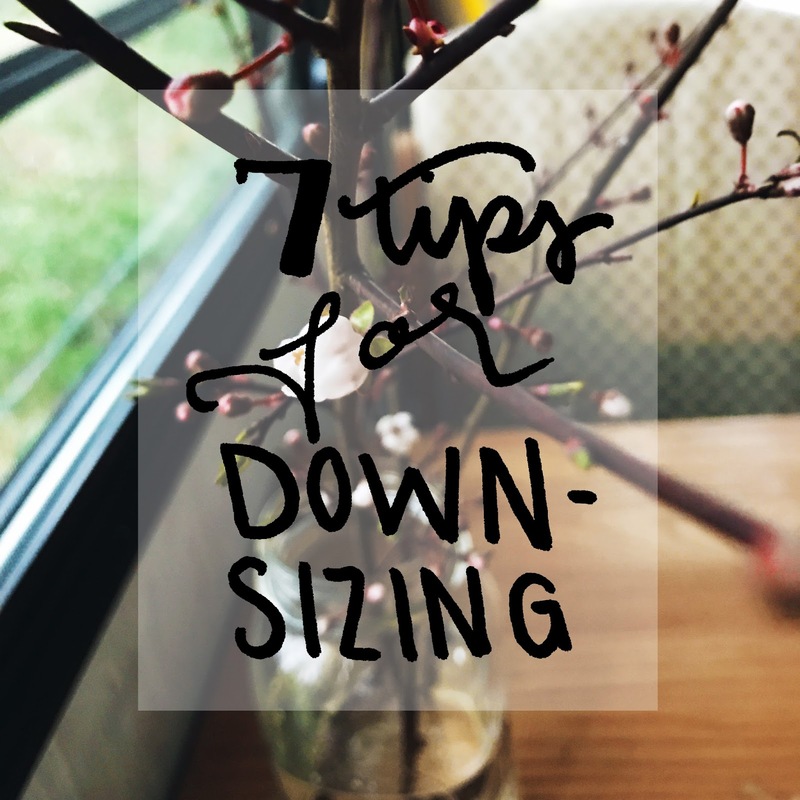 So, since I'm on downsize number three, I thought I'd share some of my tips on how to comfortably downsize, whether you're doing it temporarily or for the long haul! This one can arguably be the hardest, or the easiest, depending on who you are. This time around, I feel like this was the easiest. We've lived the last two years with half of our stuff in boxes (which helped me get rid of so much stuff when we moved back to Oregon), and it was pretty easy to see what stuff we used on a day to day basis and what we didn't. If you're moving somewhere temporarily like we are, sort through everything and take stock. What do you know you need and use daily, weekly, monthly? Go from there, figure out what you know you'll use and pack the rest up for storage. Now is a good time to get rid of things that you realize you don't use at all! Next, comes storage. We're fortunate enough to have a shop/garage on our property and all of our extra stuff is stored in there. Maybe you have a similar option, or you know someone else who does and would be willing to let you use/rent space from them. You could rent a storage unit (climate controlled if you're worried about/have valuable or fragile things!) or you could rent a storage container to be brought to your property. If you're downsizing for long term, you probably want to get rid of extra stuff for good, instead of storing it. Have a yard sale, donate to charity, and or let friends and family come shop your stuff! Be strict with yourself. Don't hang on to things that you never use, even if they're sentimental. With a couple of exceptions, we try to only keep what keepsakes will fit in one tote box each. If you don't LOVE it, and it never gets used/sees the light of day, sell, toss, or donate. 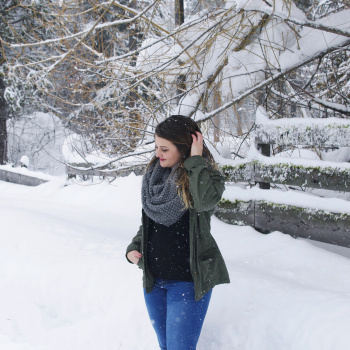 If you know you're only going to be living small for the summer, you probably won't be needing your winter coat and boots, right? Or if it's winter, maybe all of your grilling utensils don't need to be taking up usable space in your kitchen. If your move is temporary, sort out only the things you use during the season(s) you know you'll be using. Now, sometimes plans change (like ours) and you may find that your one season turned into two or more, but if that's the case you can just swap out from your storage as needed. We thought we'd only be living in our trailer for the summer, and so our winter clothes got packed away. Now that our stay looks like it'll be stretching into fall, I know we will have to rotate things out as the weather changes. This tip works even with a more permanent move too. If you downsized and know you only have limited closet space in your bedroom, only keep one seasonal wardrobe in there at a time. Store alternate seasonal items in totes in the garage, attic, hall closet, or under your bed! Wherever you have the room. When you're living in a smaller space, the last thing you want to see all the time is a lot of clutter! Make sure that everything you keep has a home. Don't keep five throw blankets if there's only room for three in your basket. If you only have space for a small tote of cleaning supplies, thin them out and only bring what you absolutely need. We were fortunate that our trailer has quite a bit of storage, so even things like my craft items have a spot to go. For things that we don't have room for (like laundry baskets and detergent), I keep in a spot in the shop or in my car for when I go to the laundromat. They don't stay inside the trailer because they don't have a home! Nothing makes a small space seem smaller than when it's messy. Small spaces might clean up faster, but they also get dirty faster! This is probably the biggest struggle I have with living in a smaller space. If the dishes don't get done one day, or the mail gets brought in and set on the table and the shoes kicked off by the door, and....you get the picture. It's really easy for things to get overwhelming very quickly. And even though the space might clean up faster, it's so much less stressful to tidy and clean up as you go. If you have less stuff, and you tidy up after yourselves during the day, your home will feel bigger and more relaxing. So, maybe you're downsizing because you have to, and not because you want to. Maybe you're renting and can't do much to improve the space. Maybe you're like us, and living in a 90s trailer, with pink carpet and a pink and teal floral motif throughout, haha! Even if you love where you live, you can still do little things to make it more homey. Burn your favorite candle, or use a yummy room spray! Bring in house plants, or fresh cut flowers to brighten things up. Turn on your favorite album or playlist, or make your favorite meal. These are all things that take little to no space and really make your house (or trailer) feel like home. Just because you live in a small space, doesn't mean you can't play hostess. Maybe you can only invite one couple over at a time. Or host outdoor gatherings during warmer months. Invite your mom over for coffee or your bff to watch a movie! Spending time with those closest to you doesn't always require a ton of space. Getting out of your tiny space can be a good thing sometimes too. Go to the famer's market on the weekend, go out to dinner with friends, take a hike, or go swimming at the river. One upside to downsizing is that it gives you the excuse to get outside and explore the world around you!